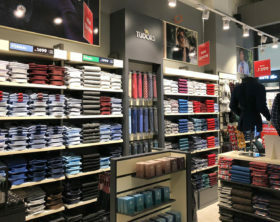 BJN d.o.o., regional franchise partner of the Turkish menswear brand Tudors, announced that it achieved successful business results in 2018. The brand’s sales in Serbia grew by double digits last year, following new store openings in Vranje, Paraćin and Promenada Novi Sad shopping center. BJN d.o.o, regional franchise partner of the Turkish menswear brand Tudors, opened its new store within Promenada Novi Sad shopping center in Serbia on the 15th of December. Tudors, Turkish menswear brand, opened its new franchise store within City Center one Split at no. 207 Vukovarska Street, Croatia, on the 26th of October. BJN d.o.o., regional franchise partner of the Turkish menswear brand Tudors, will open on the 19th of May its first Tudors store in the Serbian town Vranje. With the new opening the brand will have a network of 14 stores in Serbia. Turkish menswear brand Tudors opened on the 12th of December its new store within City Center one East at Slavonska avenija no. 11d Street in Zagreb, Croatia. BJN d.o.o., regional franchise partner of the Turkish menswear brand Tudors, opened on the 8th December its first TUDORS store n Bulgaria, located on Vitosha Boulevard no.63 in Sofia. BJN d.o.o., regional franchise partner of the Turkish menswear brand Tudors, reopened on the 23rd of August its redesigned store on Knez Mihailova no. 34 Street in Belgrade, Serbia. BJN d.o.o., regional franchise partner of the Turkish menswear brand Tudors, opened on the 23rd of May its new store within BIG FASHION Shopping Center at Višnjička no. 84 Street in Belgrade, Serbia. BJN d.o.o, regional franchise partner of the Turkish menswear brand Tudors, has opened on the 2nd of February its 5th Tudors store in Belgrade, located on Bulevar Kralja Aleksandra Street no. 140. BJN d.o.o, Serbian retail company and regional franchise partner of the Turkish menswear brand Tudors, has opened on the 22nd of December its new store in Hungary, located within Arkad Shopping Center in Budapest. MonteCristo SL, owners of the multi-brand retail chain Modiana since July 2016, signed an agreement with the Serbian company BJN d.o.o to commission sell the Turkish fashion brand Tudors throughout the Modiana stores in Slovenia. BJN d.o.o, regional franchise partner of the Turkish menswear brand Tudors, has opened on the 2nd of April its 11th Tudors store in Serbia, located on Trg pobede street no.7 in Vršac. BJN, regional franchise partner of the Turkish menswear brand Tudors, opened on the 11th of March its 4th Tudors store in Belgrade, located in Ušće Shopping Center. BJN, regional franchise partner of the Turkish menswear brand Tudors, is planning to open on the 22nd of February its 9th Tudors store in Serbia, within Delta City shopping center in Belgrade.